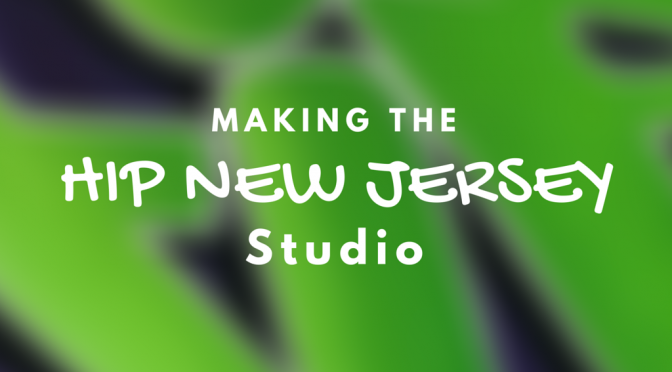 #HipNJ has launched our own mini reality series, Making the Hip New Jersey Studio! The series details our quest to craft the perfect studio setting and getting it to the place where we truly believe that it can be. We hired New Jersey-based graffiti artist Shawn Mack, who is ready to show us the final product! “Ahead of schedule and below budget is always a plus,” #HipNJ’s Lisa Marie Latino states. Shawn delivered on both ends of the spectrum. Shawn steps out of the studio and asks, “Do you want to check it out?” The moment we have been waiting for has arrived. Now, time to decorate. We filled the studio with stylish goodies to make the room complete. “My wildest studio dreams have come true,” Lisa states as the series comes to a close. Mack runs CreativSite, specializing in creativity and custom design work for interior/exterior, canvas and more. To learn more, check out their website, “like” them on Facebook, and “follow” them on Instagram. Thank you for watching, and be sure to subscribe to our official YouTube page to keep up with all things #HipNewJersey. We hired New Jersey-based graffiti artist Shawn Mack, who was sent back to the drawing board after showing Lisa his first design plan. Now, he comes back with a new design that Lisa loves and approves. “In order to create anything on any wall, it starts with a sketch,” Mack explains. He takes us through his creative process, and gets to work on the wall. “You have to come up with your own formula that works best for you,” he says. Despite the toxic fumes throughout the office, great progress is being made. To see what happens next, be sure to stay tuned. New episodes will be released every Wednesday on our official YouTube page. One girl is living at home again after her fiancé calls off their engagement. Her best friend’s blooming NYC career takes a sharp turn when her company lets her go, taking her back home as well. While the two are excited to reconnect by hitting up the clubs, they are left with the looming question of what comes next for them. What exit will they take? This question, among others, is answered in What Exit?, a NJ-based series that is hitting the web throughout the #GardenState. The show tells the story of Tina and Lexi, two struggling 20-somethings living in New Jersey. Some cast and crew from the series stopped in the #HipNJ studio to share with us a little about the show and how it came to be. Director and creator Sophia Eptamenitis told us the show was originally written as a feature. With a restricted budget, she decided to make it a web series instead. She was working on a short drama prior to What Exit? but came across a draft of the web series’ script and decided she wanted to move forward with that instead. Lauren Klemp, who plays Claudia, Tina’s college-aged younger sister, studied theatre at Fordham University and does a lot of work in the field, but enjoys working with Eptamenitis on What Exit? the most. Jessica Carollo, who portrays Tina, has been around the acting business all her life and studied at Circle in the Square Theatre school, located in Manhattan at the bottom of a Broadway theatre. Klemp enjoys letting loose while filming the club scenes. Carollo particularly enjoys filming conversational scenes between two characters. “It was just more personal and intimate,” Carollo said. Learn more about the show and how you can view it by visiting its website, liking it on Facebook or following it on Instagram. Circle in the Square Theatre SchoolFordham Universitygarden statehip new jerseyhipnjInstagramJessica CarolloLauren Klempnew jerseynjSophia Eptamenitissummerweb seriesWhat Exit?